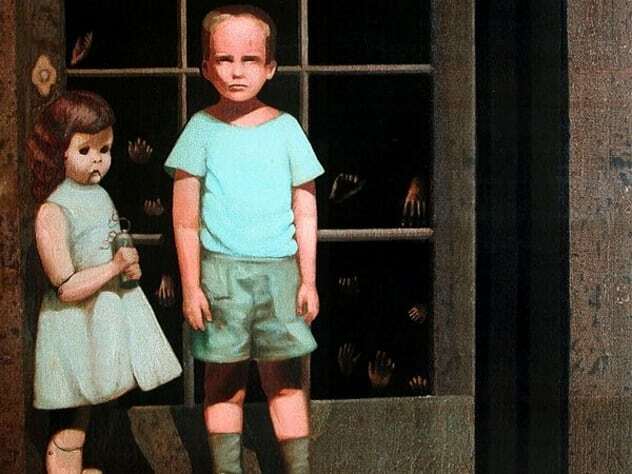 The Hands Resist Him depicts a young boy standing on a porch with what looks like the life-size dummy of a girl. Behind them is a glass door with lots of hands. The painting was created by Bill Stoneham and is a recreation of a similar photograph his parents had taken of him and a neighborhood friend when he was just five. In 1972, Stoneham, now grown and married, was contracted by Charles Feingarten to create two paintings a month for his gallery. It was during this contract that Stoneham created the painting and titled it after a poem written by his wife. The poem, titled “Hands Resist Him,” was about Stoneham’s adoption and the fact that he never got to meet his real siblings. The painting was almost like the photograph, except that Stoneham added lots of hands to the glass door behind the children (and made the girl into a dead-eyed dummy). Whether the hands have bodies or not is left to the viewer to decide, although no bodies are visible. In 1974, actor and producer John Marley bought the painting. The story of the painting being haunted started after three people involved with it (including Marley) died between 1978 and 1984. However, Marley sold the painting before his death, and it appeared on eBay in 2000. The family selling it claimed their daughter saw the children leaving the painting and fighting. No one in the family believed the girl at first, and her father even set up a motion camera to prove her wrong. To everyone’s surprise, the camera supposedly caught the girl leaving the painting and forcing the boy out at gunpoint.